At the end of a VMware vCD installation, you must load the vCD components and Sysprep. Mike Laverick explains the steps and offers his final thoughts on creating a vCD home lab. This series chronicles how to install VMware vCloud Director (vCD) in a home lab. VMware vCD is a new management product for private and hybrid cloud architectures. installing it at home offers IT professionals a safe setting to test and evaluate VMware's cloud product without jeopardizing production resources. After installing Oracle Enterprise Linux and XE, the next step is the RPM installation process and configuring Secure Sockets Layer (SSL) certificates. This section covers installing VMware vCD components as well as final thoughts on the vCD home lab project. 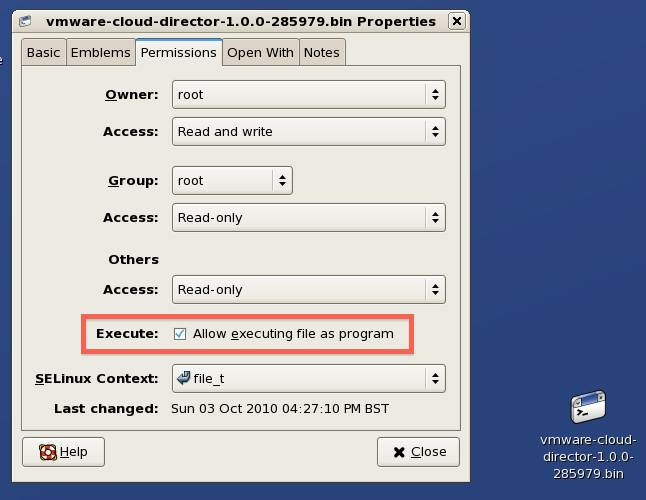 VMware vCloud Director is a .bin file, and before it can be executed, you need to change the file permissions. You can modify the permissions through graphical tools by right-clicking the file and selecting its properties. Then choose "Allow executing file as program" in the Permissions tab. Execute the .bin file by typing "./" before the file name, which is similar to running a Microsoft PowerShell .ps1 file. If you install vCD in an unsupported Linux distribution, such as Oracle Enterprise Linux, the installer will warn you. But despite this warning, you can proceed through the process. The installer also checks whether the prerequisite RPMs are installed, and it will abort the installation without them. In the screenshot below, I did not install the compat-libcom_err RPM file. If the prerequisite RPMs are installed, the .bin file will check for sufficient free disk space. Then, it will extract an RPM file called vmware-cloud-director-1.0.0-285979.x86_64.rpm to the same location as the .bin file. So, when you run the .bin file, you need read/write privileges. In this article, I cover only the standalone configuration. But in production builds, you can have two or more vCD cells that create a redundant "clustered" configuration. For a clustered arrangement, a "shared transfer server storage" location must be mounted prior to configuring the vCloud director for the first time. the database username and password. After the configuration process, press Y to start the vmware-vcd daemon. In the vCD configuration utility, many users will probably struggle with "Enter the database service name?" step. VMware has made this more confusing than necessary. 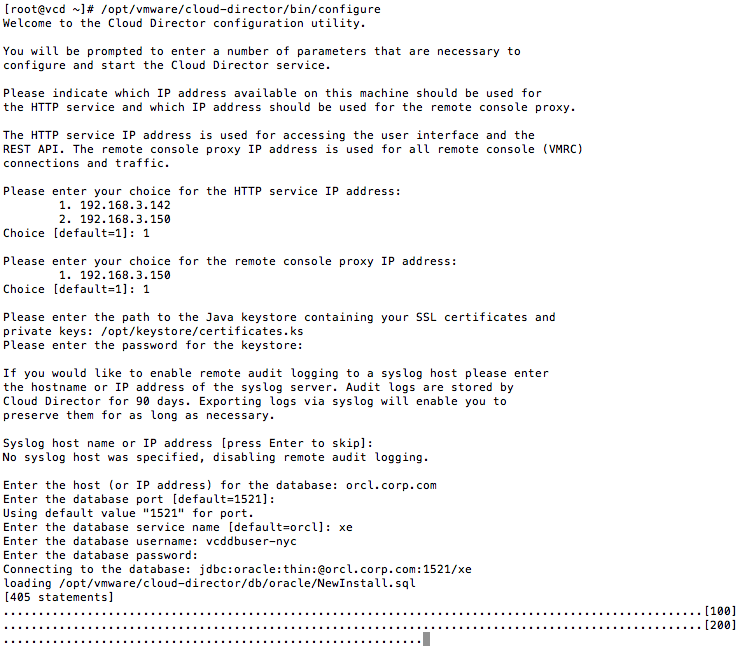 Both the script and VMware's online documentation suggest that it's likely "orcl". In my limited experience with Oracle, this hasn't been the case. 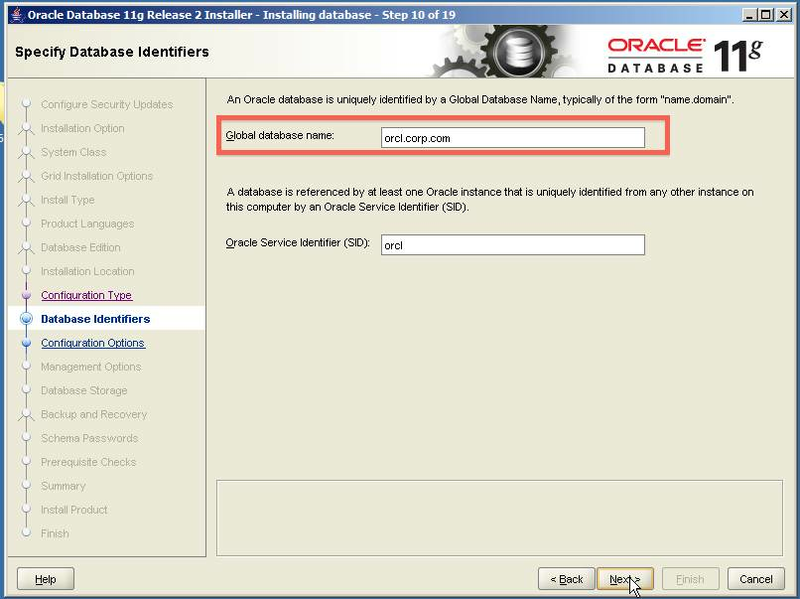 In the installation of Oracle Express previously, the service name is XE. If you use the full production version of Oracle, the database service name is likely a fully qualified domain name (FQDN). You can see this name in some of the dialog boxes during the installation of the full Oracle 11g Enterprise product. The "orcl" text may be the database service name, but it's more likely to be the unique Oracle service identifier. And often, the database server name is the same string as the global database name". To find the service name, or global database name, type the contents of the.tnsnames.ora file held in $ORACLE_HOME/network/admin. As you create a new virtual machine (VM) from a template in vCenter, Sysprep (or the System Preparation tool) ensures that you gain a unique security identifier, Network Basic Input/Output System (NetBIOS) name and correct domain membership. VMware's vCD has a deployment engine that can also use Sysprep, for the same reasons. It allows users to select VMs from a published list, which VMware calls a "catalog." As with vCenter, for this arrangement to work, you must copy the various flavors of Sysprep to vCD. Then, run a special script that compiles the Sysprep files into a format that can be used with the system. The easiest way is to copy the Sysprep files from vCenter to a temporary location on the vCD host with something like WinSCP. or to locate copies of Sysprep on a file server. (In my line of work, I build and rebuild vCenter instances frequently, so I always have a copy available). Note: With Windows 7 and Window 2008, Sysprep is stored locally within the C:\Windows\System32 directory structure. Therefore, you don't need to copy those files to vCenter or vCD. You don't have to copy the winxp_64 version of Sysprep if you're 100% sure your cloud will never run this flavor of Windows. But when you run the compile script, it warns you when directories are empty. In my case, I copied the Sysprep files over to the tmp location. Then, I ran the deployment package script. As you can see in the screenshot below, I received an error because the win2k3_64 directory was empty. I've never run this version of Windows in my lab environment. Now you can connect to your vCD server through a Web browser by entering https://vcd.corp.com. There are some caveats; for example, I use a Mac, though it's not officially supported. VMware currently supports Internet Explorer and Mozilla Firefox on Windows and Firefox on Linux. In my brief experience with vCD, Firefox on a Mac works. But I was unable to install the Remote Console plug-in, which allows a vCD user to open a window on a VM to interact with it. Regardless of the OS and Web browser, you must install Adobe Flash, because the main administration tool is based on Adobe Air. The Web browser must be 32-bit, because vCD does not support 64-bit Web browsers. 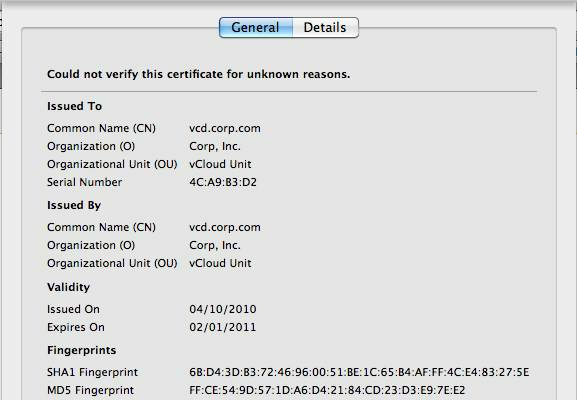 When you first connect, you will receive a warning that your vCD certificate is untrusted. You can confirm the connection by viewing the certificate details, as illustrated in the image below. The first time you log into vCloud Director, you will see a "run once" welcome screen. This screen allows you to configure the basics, such as accepting the licensing agreement, inputting your vCD evaluation license key and creating a vCloud administrator account. Even getting this far withinstalling vCloud Director is a bit of a struggle -- especially if you're not skilled with the Linux and Oracle databases. There's a dizzying array of user accounts and passwords to remember. I guess that befits the first release of a product; version 1.0 products are notorious for obtuse setups and postconfiguration phases. It's unlikely that many enterprises will run vCD in a production environment, but they may want to kick the tires for a proof of concept. In the near term, public cloud vendors will likely be the sole users of vCD.